Christine completed the first two legs of the Mary Leishman Foundation Sponsored Walk to raise funds for the Foundation and also the Young Pars. After walking from the Tay Bridge to St Andrews on the Wednesday the next day took her from St Andrews to Crail. Although feeling a bit sore she was pleased to complete the 30 miles. Anyone who would like to make a donation then please do so. If anyone has been good enough to download a sponsor form then please send the form with monies to either Christine or Jean. We’d like to remind all our members that the Club will be holding its annual Open Day at East End Park next Sunday 17th May and the Young Pars will have a stall there. Well, unfortunately, we will not be heading off to Hampden for a final this season. If you were at the semi-final we hope you had a great day anyway! Can you believe we are on our way to Hampden again?! This will be the seventh time in five years! For a club like Dunfermline that’s a fantastic achievement! Can’t wait! What a fantastic atmosphere it was at last week’s game! � Wouldn’t it be great to get crowds like that every week? Let’s hope we can do the business on Tuesday and get to another Cup semi-final! It would be a fantastic game against our old rivals, Falkirk! It seems ages since we last played Aberdeen and we are really looking forward to today’s game. Let’s hear you all making a lot of noise by cheering the team on to another Cup semi-final! Come on, ye Pars! What a season this is turning into with all the match postponements because of the weather. Let’s hope the worst is now behind us and we can catch up on the games still to be played! Mind you, we’re pretty sure most of you have been enjoying all the snow – especially if you got an extra day off school! We enjoyed the win here last weekend and now we’re looking forward to the next round of the Scottish Cup in February – an away tie against today’s opponents! 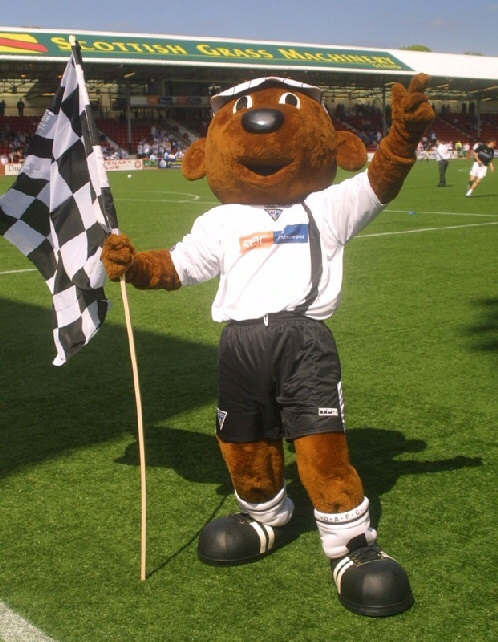 Come on, ye Pars! We’d like to start by wishing Young Pars members, their families and everyone at the Club a Happy New Year! Let’s hope 2009 turns out to be a successful year both on and off the park! A reminder to all those who would like to travel with us to the game against St Johnstone at McDiarmid Park, Perth on Saturday 24th January, you should phone Christine (01383 822012) or e mail pars@youngpars.co.uk to book your place on the bus.� As well as free entry to the game as part of our exchange agreement with St Johnstone, the bus will now also be free to Young Pars members, thanks to Mr Chris Wishart who has kindly offered to sponsor the bus. Hope you all had a lovely Christmas! Pity it’s all over but hopefully we will have lots to cheer about at the end of today’s game! Only four more days before Santa comes calling! � We’re all getting very excited! Let’s hope we get an early Christmas present with a good result here today. Young Pars at Bowlplex with Scott Thomson, Paul Gallacher, Calum Woods, Greg Ross, Scott Muirhead and Greg Shields. We’d like to thank everyone who came along to our PartyLite Candle party in the Kingdom Suite on Thursday. This was held to raise funds for the Young Pars and we really appreciate your support. Today we welcome another of the teams we do exchange visits with. We have already travelled to Dens Park with the Young Pars and now it’s the turn of the Junior Dees to visit us. We hope you enjoy your visit – but not as much as the Super Js enjoyed theirs last week! We definitely do not like being beaten at home! We’d like to extend a warm welcome to the Super J’s (St Johnstone’s equivalent to the Young Pars), who are our guests here today as part of our exchange programme. Well, this is us heading into the second round of games for this season. Partick took all three points when the teams met on the first day of the season, so here’s hoping we can take our revenge for that result today! It’s always exciting to be involved in Cup games on our home ground, isn’t it? It wasn’t so long ago that we were playing St Mirren in the SPL so this should be an interesting game. What a busy time we had last weekend! First we took a bus of Young Pars to Dens Park to watch the Pars play Dundee on Saturday then Sammy the Tammy had his birthday party on Sunday. It’s hard to believe the football season kicked off only five weeks ago! In that time we have played nine games including today’s game – six of them here at East End Park! This is a very busy time for everyone at East End Park just now with so many home games so we thought we would take this opportunity to mention the ball boys and girls who work very hard throughout the season – sometimes in awful weather conditions! Have you all enjoyed your first week back at school after the summer holidays? Bet you couldn’t wait to get back! Well, we’re certainly starting off the new season with a few home games, aren’t we? Tonight’s game is the first of four at home between now and the end of the month – two cup games and two in the league. We’re pleased to see that so many of you have rejoined the Young Pars for this season and look forward to seeing you at some of the forthcoming events.